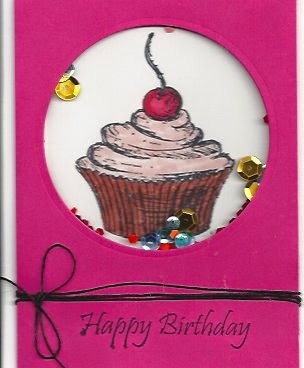 Hi Everyone, Today's card is made with new products from Fun Stampers Journey and is a lot of fun to make. I started with whip cream card stock, placed the starburst lines stencil on top, using my spatula and journey modeling paste worked it into the stencil then took the stencil off and allowed it to dry. I then took journey gel medium and mixed with sweet berry acrylic paint and sponged it all over the starburst once it dried I sanded it lightly and then went over in spots with the oatmeal acrylic paint doing the same as before. 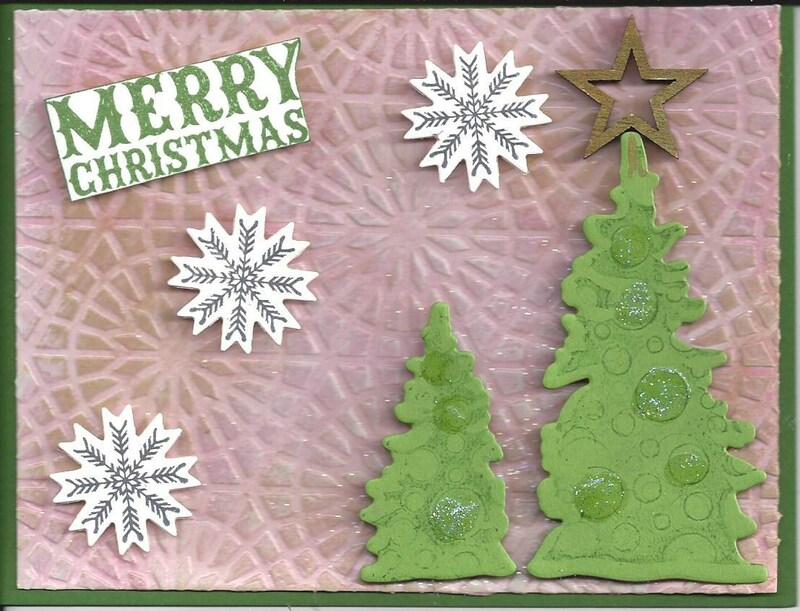 Using fsj winter holiday die I cut out the two trees laid our bubble bubble stencil over them and used green ink pad to show the circles. 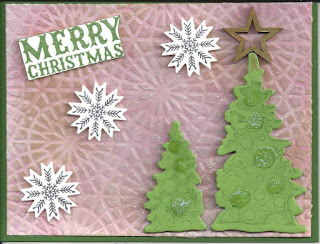 Stamped the snowflakes on whip cream from the winter holiday stamp set and die cut those as well. Added all of these to the card base and added our free wooden star at the top, which you may chose with a $50 purchase free called star frame. I am having so much fun with these new products that I hope you will join me in using them. 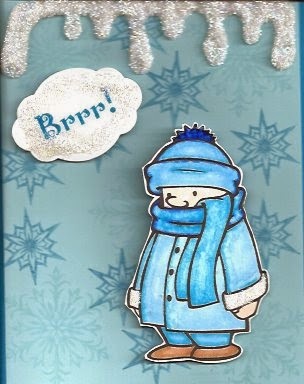 This is one card we are making in our card classes coming up. Have a great day. 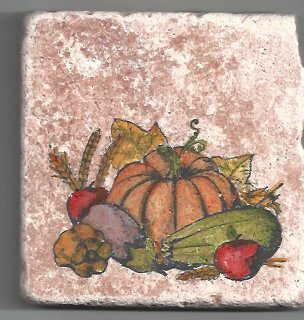 Here is the card and coaster set that we will be making in some of my Oct. & Nov. workshops, classes, and gatherings. These are my color crush combinations, re-inkers citrus cooler, summer days, pretty amethyst, lemon grass, rich coral and they may be found on my web site. I used the stamp set "harvest" At-0051 on both and then the words "great harvest" from the Great Harvest stamp set SS-0236. My accents which are hard to see here are Journey Glaze and Sparkle Dust. I used our new blending brush and fusion blender to color both. These new tools and items are really fun to use especially if you like to color. If you have any questions please let em know. Have a great and special day. We had the great privilege and fun of going to the Fun Stampers Journey Offices. 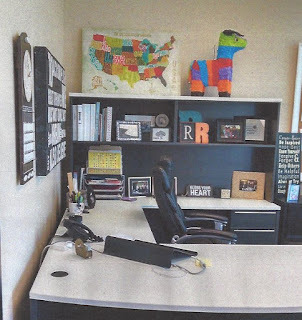 This was one of the first offices we saw and it is our co-founder Richard Garay. You can see how fun it looks well he is just that way. We had a blast at this convention. We had demos, make and takes, lots of learning classes and a lot of fun. My husband went with me and he had a great time. He is really excited to see our team and company grow. This was our first convention and we had the privilege of meeting not only our two co-founders but also our CEO of the company. I will be sharing a lot of news with you in the next few weeks. One new thing is that for every order that is over $50 will receive a free gift. They are pictured in the front of our catalog and I will share that picture next time. If you have questions or want to schedule a party just let me know. My cell/text # 616-402-8509 or home phone 772-398-4301. Have a great and wonderful day. 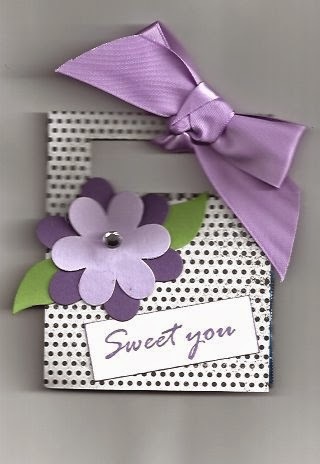 This card was made using several of our Journey Fusion Inks. 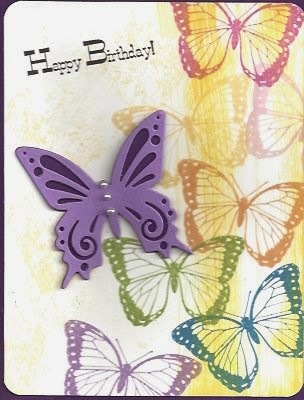 I ran lemon drop ink on the base card before stamping the butterfly from Enjoy the Journey SS-0035 stamp set in a variety of colors. Then using pretty pansy CS-0029 and lavendar fusion CS-0017 along with the artful butterfly die SI-0007 I cut out and attached the butterful putting some small pearls for its body. It made a very colorful birthday card. If you have any questions please just contact me at serif1@aol.com or text me at 616-402-8509 or call me at home 772-398-4301. Have a great and blessed day. Today I am showing you what my gift is for those I meet at the Orlando Expo this weekend. If you are near please look for me. I will have on my jeans and red shirt on Friday with my apron and pins. It contains a piece of Ghirardelli chocolate just what a gal needs. 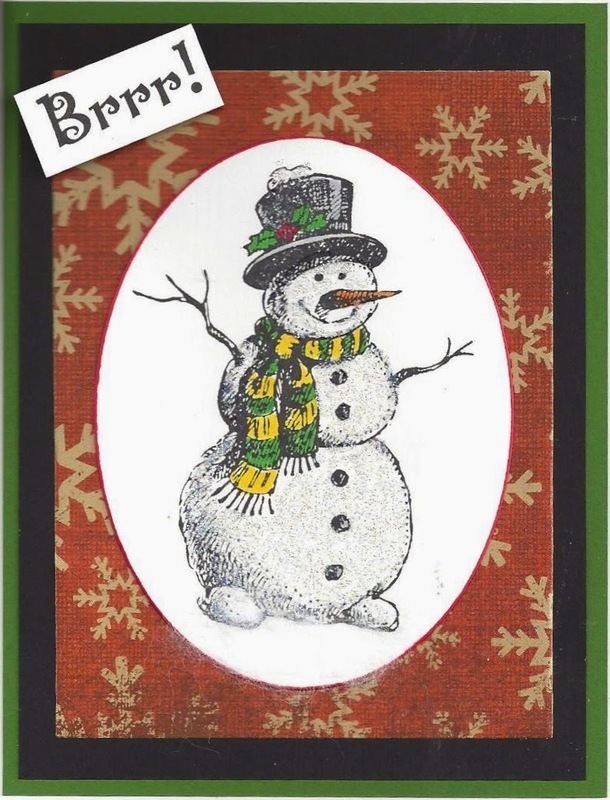 This was made with our dies, black and white paper, ribbon, cardstock and stamps. Anyone joining my team will receive a set of swatches of all cardstock, paper, inks, and ribbon on separate rings along with a die from me. This will be my gift to my downline. Hope this finds you all doing well today. 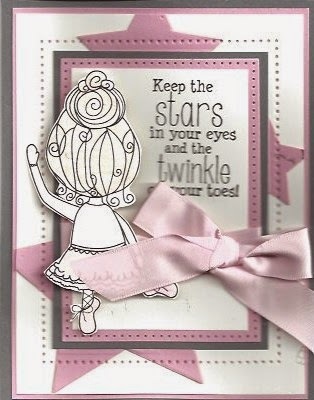 Here is another card made with the kit of the month for Feb. called Twinkle Toes. Love this set as there is so much you can do with it. The kit can still be order so if you are interested just visit my web site at www.funstampersjourney.com/angelhugs and find out about it. Have a great week and I will see you later this week. This is one of the stamps that is in the set for February. It is called Twinkle toes and has 6 stamps in it. This is a cute one for little girls and could be used for a birthday also. 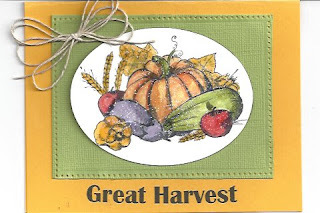 I am enjoying the kits of the month as you get a stamp set, all the cardstock, and extras to make 4 cards. The stamp set is available that month only at this time. I am looking to increase my team so if you are interested in joining me on Fun Stampers Journey just let me know. I will be happy to email you more information and send you a catalog if you would like. If you are in Orlando on March 6-7 please come to the scrapbooking expo at Gaylord Hotel those days. I will be there and would love to meet you. If I can help you in any way please either email me, text me or call me. I have had a hard time getting a picture to post on my blog but now I think I'm getting it. Hope you enjoy my Snow Buddy. I really do miss the snow but the warmer weather is nice in the winter. 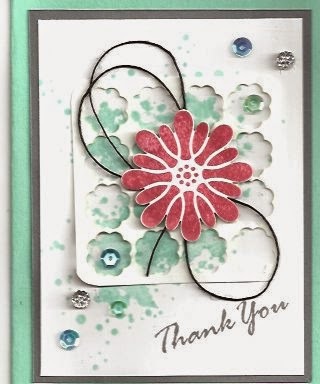 I used all everything here from Fun Stampers Journey as I am now one of their coaches. Will post more tomorrow using the stamp set for this month that comes in the monthly kit. Have a great day. 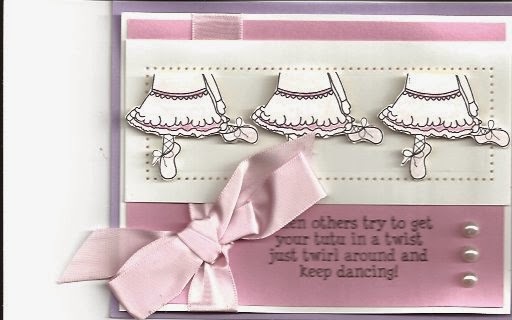 This is my first card using the new Fun Stampers Journey items. I wanted to see how it looks as I'm changing my blog to go with me. I used white, black, kiwi green cardstock. The background design paper is out of the holiday collection. The snowman is the AT-0106 called Frosty Fun and I stamped him with black ink. I then used markers to color him and added journey glaze along with journey sparkle dust to give him a shine. Hope you enjoy and if you have any questions let me know. Have a great and Happy New Year!